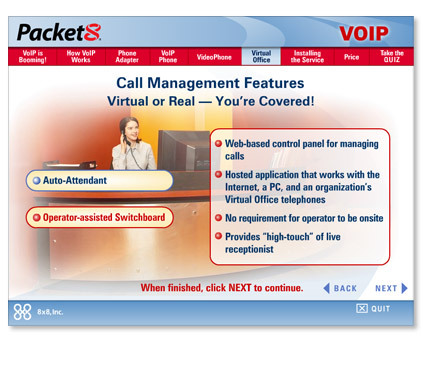 Problem: Packet8 needed to train sales associates in major retail outlets, and e-commerce partners how to sell their VOIP telephone product. Solution: Events Online created effective, online training that made hard-to-imagine concepts easy to explain to customers. The training includes testing, tracks results and provides performance reports to Packet8 that are compared to product sales numbers. The data proved that our Packet8 training jump-started sales nationwide. Click to view the training.